The correct name of this diagnosis is Down syndrome. There is no apostrophe (Down). The “s” in syndrome is not capitalized (syndrome). An individual with Down syndrome is an individual first and foremost. The emphasis should be on the person, not the disability. A person with Down syndrome has many other qualities and attributes that can be used to describe them. Encourage people to use people-first language. “The person with Down syndrome”, not “the Down syndrome person.” A person with Down syndrome is not “a Downs”. Words can create barriers. Recognize that a child is “a child with Down syndrome,” or that an adult is “an adult with Down syndrome.” Children with Down syndrome grow into adults with Down syndrome; they do not remain eternal children. Adults enjoy activities and companionship with other adults. 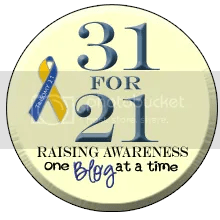 This entry was posted in 31 for 21, Disability Resource links, Soapbox, The Quail. Bookmark the permalink.